The BD135 and BD139 are silicon Epitaxial Planar NPN transistors mounted in Jedec SOT-32 plastic package, designed for audio amplifiers and drivers utilizing complementary or quasi-complementary circuits. The complementary PNP types are BD136 and BD140 respectively. 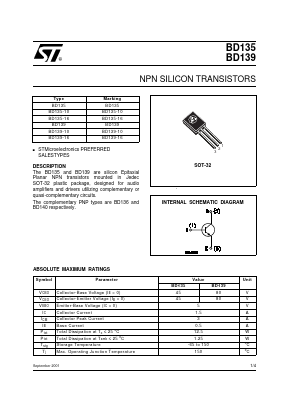 MMBT3904LT1 Transistors (NPN) View Silicon Standard Corp.